Heth and Moab Explorations in Syria in 1881 and 1882 - Claude Reignier Conder 1883 - Richard Bentley & Son, London - First Edition	A bright copy in original cloth of Captain Conder’s substantial record of his explorations in Syria between 1881 and 1882, published for the Palestine Exploration Fund. Conder began his expedition in North Syria, before travelling to Kadesh and Jordan, and his work includes chapters on Mount Gilead, Ammon, and the Belka Arabs, as well as Syrian superstitions and Arab folk lore, together with a detailed appendix. 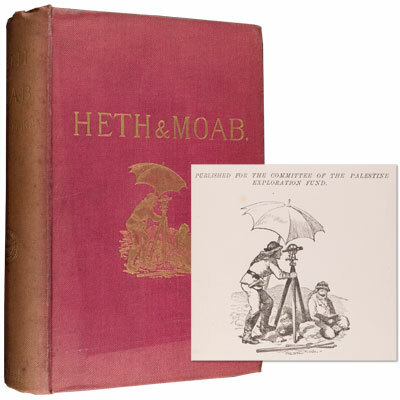 Illustrated with four full page engraved plates, and a sketch map of Syria. Claude Reignier Conder (1848-1910) was a British soldier and explorer, and the great-great-grandson of French born 18th century sculptor, Louis-François Roubiliac. In recent years he as also become one of more than a hundred candidates for the Jack the Ripper murders, as hypothesized by author Tom Slemen, who suggests possible links between Conder’s excavations in the Middle East, the theft of rings he extricated from King Solomon’s Temple in Jerusalem stolen by one of the Ripper’s victims, and a cover up by Sir Charles Warren, a police commissioner investigating the Whitechapel murders and a personal friend of Conder. Provenance: from the library of Lord and Lady Raglan, from their personal library at Cefntilla Court, Llanderry, Wales, with their Cefntilla bookplate to the front pastedown. References: The Spectator Archive 1884, web. Palestine Exploration Fund Quarterly Statement 1984, web. Isaaman, Camden Review, 2010.